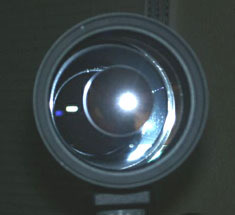 This scope is actually marketed as a camera lens and has been carried in various colors with a number of vendors. It is an Synta MC90 - a 90mm Maksutov-Cassegrain at f/5.6 rather than the usual f/10+. I purchased my scope from O'Neil Photo and Optical of Ontario, Canada. O'Neil sells this scope for $340 Cdn or about $220 US, plus $12 or $18 shipping. 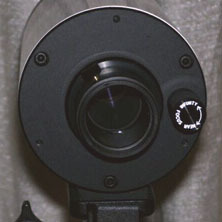 The MC-90 comes with a diagonal/eyepiece holder, covers for both ends, and a tripod mounting block. It's all packaged in a very nice padded case with movable dividers. 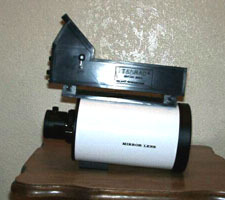 Note that it does not have a finder or finder mount and does not come with diagonal or eyepiece. 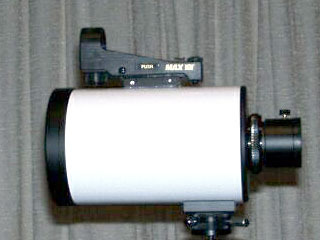 Aside from the white tube and shorter focal length, this scope is the same as Orion's Apex or StarMax 90mm. Take a look at Orion's web site for information and accessories on the Apex/StarMax line. The site has nice photos of the scope and bag. Sky-Watcher carries it with the same model number and appears to be the same form as the Synta. directions for near and far focus. Finding rings for the scope may be a problem because it's just a bit too big to fit the standard 4.1" rings and much too small for the next size up at 4.6". You could pad the 4.6" rings or use 4.6" three point rings like those from Scopestuff.com. Another complication is the placement of the tripod block - It sits less than 1/2" from the rear cell, leaving only 4" between the front of the block and rear of the lens cover. I have also used Orion's ball head camera mount set on the rails with a standard 1/4-20 bolt and star washer. (Just pull up and spin the unit to tighten the screw to the rail.) 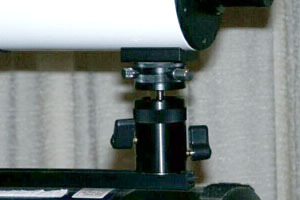 This mounting is stable enough for high magnification work and allows you to align the scope with the larger goto scope so it can perform as a super finder. Daisy's MaxView sight makes a great finder and it's tall enough to stick up over smaller eyepieces. Another minor problem is images reflected between the field lens of the eyepiece and the secondary mirror creates a bit of odd color at the top and bottom of bright planets. Using the Omcon 25mm Plossl I purchased with the scope, I had a startling image with the full unfiltered moon. Without the diagonal, this eyepiece shows the moon filling perhaps 1/4 of view and a ghostly pale blue image of the moon - in focus! - that fills perhaps 3/4 of the view. 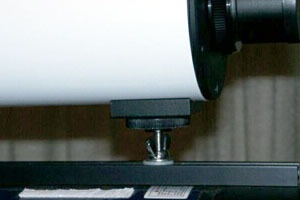 Other 25-26mm Plossl eyepieces show similar images, but are not in focus. When the diagonal is added to the mix, this reflected image is spread out enough that only bright objects show any color. For example, Jupiter shows a blue tint at top and a brown tint at bottom of the view. This might blur the details at the poles, but is easy to ignore. Besides, this is a rich field scope - Use it at low magnification to get the most out of it!